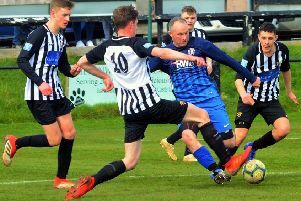 Alnwick were left to rue their luck as they went down to a 3-2 home defeat at the hands of North Shields in the Northern Alliance Premier Division on Saturday. Only the width of the crossbar denied them anything from this match as they struck the woodwork on no fewer than three occasions. Ross Moor was the first to test the frame of the goal when he struck the crossbar after six minutes. Just two minutes later captain Jonny Quinn headed over, but on 12 minutes the St James’ Park outfit took the lead when Jordan Frost headed in from a Ryan Douglas cross. Their joy was short-lived, however, as straight from the re-start North Shields went upfield and equalised with an own goal from Jack Henderson. Alnwick tried to respond and Douglas had a shot blocked, whilst after half an hour Alnwick were denied what looked like a certain penalty when Phil Airey was fouled in the box. On 37 minutes Airey was unlucky when he slid in on a cross, only to send the ball the wrong side of the post. Moore then twice went close as Alnwick made most of the running up to half-time, but at the break it remained 1-1. The second half got off to a slow start, but on 54 minutes the visitors were awarded a penalty following a slip by Frost, and it was converted to give Shields a 2-1 lead. Alnwick then rang the changes, and on 70 minutes one of the substitutes, Leon Midgley got his side back on level terms at 2-2 with a brilliant half volley. As the home side cranked up the pressure Airey sliced a shot wide, he then hit the crossbar before Midgley shot inches wide. But on 80 minutes North Shields struck for a third time when a header was missed and a striker ran through to beat the goalkeeper one-on-one. As Alnwick tried to get back on terms again, Threlfall shot wide after the ball was pulled back to him by Lowes. A free kick from Hogg then went inches over, but the home side knew their luck was out when, in the 90th minute, they hit the crossbar for a third time, through a Midgley volley.